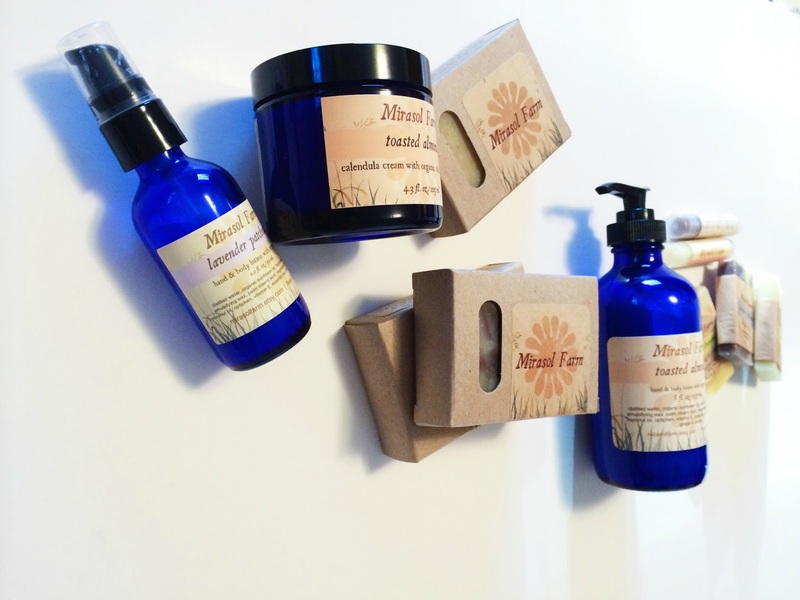 This week's Shop Spotlight features Mirasol Farm, one of my all time favorite shops for organic soaps, lotions and other body products that are created with both the customer & the environment in mind. I am head over heels for their products and their incredible customer service for so many reasons and as a busy Mama, life is all about enjoying the simple pleasures, like soap and lotion that not only smells incredible but that you can use without concern or hesitation. Because I have sensitive skin, for many years I've been on the search for the perfect bar of soap without all the chemicals that many store-bought bars contain. Not only that, but I wanted it to smell amazing. With no pre-made bases, artificial fragrances, parabens, petroleum products or plastic packaging, these products are ones I love to use myself and feel equally comfortable using them with Olivia. Back in May I was at a large craft fair and had the pleasure of meeting the owners behind Mirasol Farm and checking out all their fabulous products. This feature has been in the works for months now and I am especially excited to finally share it! I'm also giving away a set of 3 bars of soap of the winner's choice so one of you Mamas can pamper yourself! Mirasol Farm offers handcrafted skin care inspired by organic oils and herbs, in support of fellow organic farmers worldwide. They are based out of River Falls, WI and many of the ingredients are grown on their farm or wildcrafted locally in western Wisconsin. 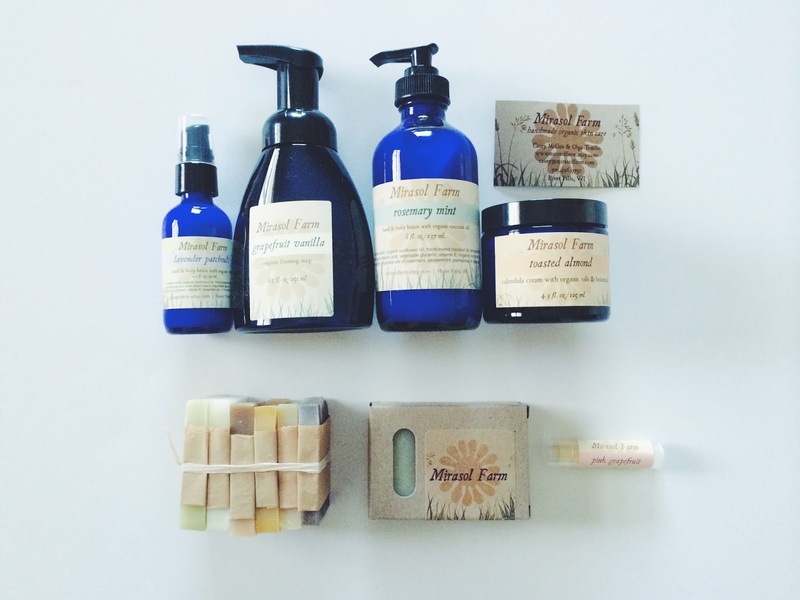 In their shop you will find organic cold-pressed soaps, creams, lotions and specialty skin care. Their vegan-friendly moisturizers are offered in blue cobalt glass bottles which is my favorite way to purchase lotion -- the deep blue is beautiful and each batch is handcrafted in small quantities to ensure a high quality product that moisturizes, is easily absorbed and makes your skin feel luxurious. What is Mirasol Farm? Who are the people behind it? Mirasol Farm is a place—our home and organic farm—as well as our business name. We’re Casey and Olga, and we live just south of River Falls, Wisconsin. Mirasol Farm is the manifestation of our dream of small-scale sustainable agriculture, and we love the mad earthly science of turning essential oils, organic oils and butters, and botanicals into skin care products that elevate the spirits. Formerly social justice workers, we try to run our business with attention to the principles of respect, compassion, and fairness. Olga balances farm duties with her other passion—working to end violence against women and children—while Casey works full-time running the daily farm operations. How did Mirasol Farm come to be? When we met, Olga had been living in D.C. and Casey in northern Minnesota. Very different backgrounds, but our common dream was to find a way of living simply and working from home, so we bought a retired dairy farm in western Wisconsin and spent a year fixing it up with the idea that we’d do some sort of sustainable agriculture. It’s been our labor of love. The Land Stewardship’s Farm Beginnings Project helped us to focus and distill our ideas. Now seven years later, we’ve built on Casey’s love of making soap and growing and wildcrafting herbs into a variety of organic bath and body products. How did you arrive at the name Mirasol? Mirasol is Spanish for sunflower. It's a metaphor for turning your face toward the sun... and a blend of Olga’s Latina roots with one of their favorite locally-grown ingredients -- sunflower seed oil. What's the process like from idea to product launch? Most of our ideas for new products start as special requests or gift ideas from customers or friends. For example, a good friend became pregnant several years ago. She was also a doula at the time, working for a non-profit organization that was helping pregnant women in prison. The idea arose to develop an Organic Mama product line with postpartum bath tea and massage oils—first for Casey’s friend, then more widely as a fundraiser for the nonprofit. The bath tea recipe has been tweaked over the years—again, thanks to feedback from customers and friends. It’s a very interactive process. What's the line of products that you're most proud of and why? Still, soap. It’s Casey’s first love. Even though organic ingredients are expensive and limit our profit margin, we’re especially proud of making organic soap. Most exotic oils—like coconut and palm, both essential soap ingredients—come from countries and peoples far away, and we feel that our buying decisions help support organic farmers around the world, healthy rivers and forests, and the human family. what sets mirasol farm apart || I have been in awe of this shop from the moment I came across their products months ago. Casey and Olga are incredibly warm and friendly, so kind and generous. Their products are top of the line and such a wide variety is offered that it would be impossible for someone not to find something they love. With both invigorating and calming scents, ingredients you can pronounce, and a passion behind the product, this shop is in a league all its own. I love the wide selection of products and scents offered -- everything from organic soaps to lotions, lip balms and linen sprays, belly butter and postpartum bath soaks...they have it all. My husband loves their products as much as I do and that is truly saying something. my favorite products || Toasted Almond everything! We have the lotion, calendula cream, soap & lip balm. I can't get enough! All Fall I'll be baking almond pound cake, almond shortbread & eating almond toffee so of course I'll be using my toasted almond products alongside it. And the #1 item I'll be giving for gifts this Christmas? Toasted Almond soap. It's that amazing // I also love the oatmeal lavender soap, wild orange soap (perfect for this cooler, cozy season), litsea & avocado soap (especially for washing my face), and the rosemary mint lotion for foot rubs! Their soap sampler packs are a great product for gift giving if you're unsure of what scents a friend or family member prefers and they would be perfect in a guest bathroom at home. You can choose between packs of 6 and 12 soap samples and they come packaged so perfectly. quality + craftsmanship || Each product is handcrafted by Casey & Olga using the highest quality ingredients from their farm and local area. The quality of the products show through in how they are packaged, how they look and smell, and most importantly -- how they feel on your body. Attention is paid to every detail and they have clearly perfected their formulas for each & every product available. overall opinion || Mirasol Farm offers the best organic soaps and body products I've found, period. The scents, the quality and the customer service keep me coming back again and again, and I'm so delighted to have found a shop I can rely on for not only myself but my family. 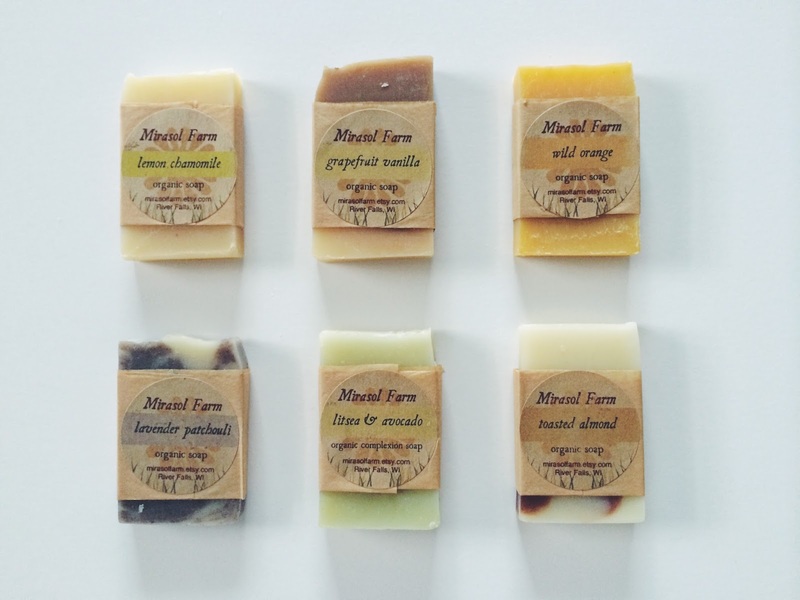 value + recommendation || If you're in need of soap, lotion, or any body products, I highly recommend Mirasol Farm. They are phenomenal in every way -- their products are ones I will always stand behind, and they are incredible people that worked to bring their dream to reality. They are especially close to my heart because of their Midwest roots, and River Falls specifically is where my dad grew up! giveaway || Casey & olga are so generously offering three bars of soap to one lucky winner! You'll be able to choose your scents from the wide variety they offer. All you have to do is complete the steps below in the rafflecopter; the giveaway runs from Monday, September 8 through Sunday, September 14. The winner is responsible for contacting a blessed nest within 24 hours of being announced. All entries will be verified. Happy Monday! I would choose the Naked for my little one, the Backpacker for my hubby, and toasted almond for me! I would love lavender oatmeal for a relaxing bath, toasted almond for a daily pick me up in shower and naked for my babe!!! What great products! I loved reading about Mirasol Farms! I've been eyeing some products for a while now, and reading a little more about the products and wonderful creators was icing on the cake! The farm girl in me is in love! I love all the scents available, but I'm wanting to try the litsea & avacado, toasted almond, and naked for the baby! I would have to go with lavender oatmeal, naked and wild orange! Maybe sandalwood rose, almond, and lemon chamomile :) I LOVE a good handmade soap!! Backpackers' soaps. All of three!!! I buy our soaps and lip balm from these talented women! LOVE Mirasol Farm (and I'm placing an order today too). Would be delightful to win a few more bars of NAKED soap. What a wonderful giveaway! I'd like to try Mother Earth, lemon chamomile and grapefruit vanilla.